Referencing macro variable in title or footnotes requires special attention. You must use double quotation when the title (or footnotes) includes a reference to the macro variable. The code below computes the summary statistics (i.e. 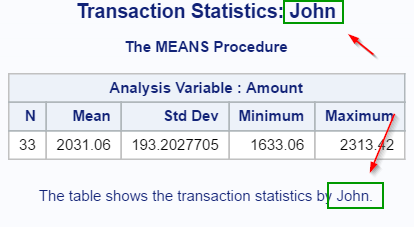 n, mean, standard deviation) for the transaction amount by the agent John. The program looks great. 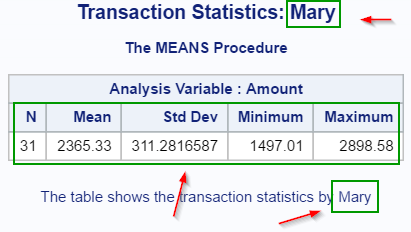 It computes the transaction statistics for John with the correct title and footnote. Now, let's add the proper macro variable to the program so that it is reusable for the other two agents. 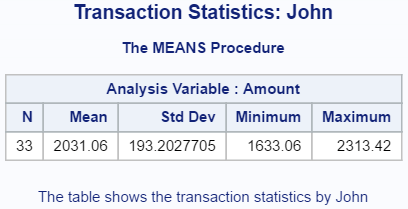 This computes the same statistics as before (John). By simply assigning a different value to the macro variable AGENT, the program now computes the statistics for Mary instead. When the program is executed, the macro variable reference (&dur) will be replaced by the value assigned to the macro variable (i.e. 20). 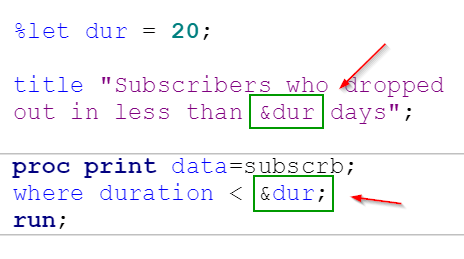 Substituting text with macro variables is fairly easy. In the next few sessions, you will learn a few more examples of how macro variables can make your program more dynamic and reusable. 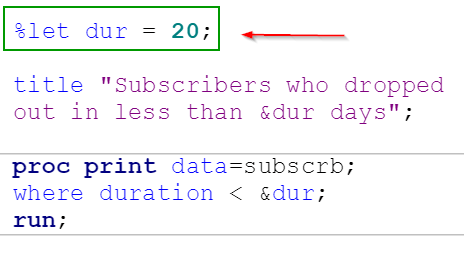 Reuse the program above and print the list of subscribers whose length of membership is less than 30 days.